The Widow is still very much up to her games and it seems that she is not going to be an easy antagonist for Quinn to defeat. It's clear that the Widow is seen as a mere woman and that at least in part is why Quinn continues to underestimate her. This episode we begin to see the lesson which Waldo tried to teach M.K. about underestimating ones opponent. This epsidoe begins with Tilda running through the woods bleeding from many cuts on her hands, face, and body. Tilda is all dressed in white as though to invoke a sense innocence I am not at all sure she possess. Tilda runs in front of a moving vehicle calling out for help and when it stops, two men get out and for their trouble, the Widow kills them. It seems that Tilda wasn't looking for help or safety and that is in fact an ambush in order to obtain gold. Back at the Fort, Sonny is trying to train M.K.. Trying is the operative word because M.K. still seems to think that he should just magically be proficient over night. When M.K. tries to attack Sonny, Sonny immediately takes M.K. to the ground and advises his young Colt that he has to do the unexpected. Later that night a worried and impatient M.K. practices on his own. Finally, M.K. pulls out a knife unaware that he is being watched by Sonny. Rather than cutting himself, M.K. puts the knife away. Jade and Lydia are planning for Jade's upcoming wedding. They sit in a room surrounded by gifts from the other Barons and when Lydia asks what role the gifts will play in the ceremony, Jade replies none since no other Barons will be attending the wedding. Jade tries once again to encourage Lydia to form a friendship or at the very least an alliance since they will both be connected to Quinn. Lydia refuses the overture but does offer Jade some motherly advice (yes full snark) that Jade shouldn't be sleeping with both Ryder and Quinn. Quinn unsurprisingly has decided that he will not go gently into the good night and to that end goes to visit Veil. This man has a whole lot of nerve. Veil claims that her father didn't have time to teach her all that he knows and the lying Quinn promises to pursue the people who killed Veil's parents and give her justice. Veil does not offer Quinn a cure outright but says that she can try a treatment to shrink his tumor. We know damn well that Veil is going to do the smart thing and hasten Quinn's death right? The next day, the curiosity about M.K. 's power gets to Sonny and he decides to test M.K. by cutting him. M.K. 's eyes turn a brilliant silver and then full black and he knocks Sonny unconscious before he falls to the ground unconscious himself. When they awake, M.K. is super pissed that Sonny cut him without warning says that he could have killed his mentor. Sonny however wants to use this as a learning opportunity and suggests that M.K. can potentially control his dark power if during the throes of it he thinks of one pure thing. M.K. is quick to ask what pure is and that is a fair question given what we have seen of the Badlands to date. With the theft of the gold, Quinn has decided to follow through on his plans to make an alliance to deal with the threat that the Widow poses. To that end, he decides to send Ryder to meet with Zephyr. Ryder assumes that his father is setting up as a sacrificial lamb and bristles at the very idea. The tension between the two men is absolutely palatable. Quinn is all to aware that his son has been up to something and that Jade is involved somehow. When Ryder does finally meet with Zephyr, he delivers his father's message but adds that he has his own deal that he would like to propose. Quinn may very well get his in the end but I highly suspect that Ryder will be shoved back into his place long before then. Sonny walks into the barracks and tells the Colts that he needs a few of them to act as scouts for the upcoming parlay. M.K. is upset that he wasn't among one of the chosen few. We all know that M.K. isn't going to stay behind because he never ever follows orders though he is in way over his head. Naturally, on the way to the parlay, Sonny discovers M.K. and so orders the young colt to stand as look out as he continues on with the Baron and a group of clippers. At the parlay, Quinn makes it clear that he was not responsible for the ambush and blames it all on the Widow. Jacoby isn't at all accommodating pointing out that it was Quinn who invaded the Widow's territory in the first place. Quinn brings up the alliance that he had with Jacoby's father but Jacoby is not necessarily convinced that their agendas are still aligned. From his look out position, M.K. notices Tilda and yells look out just as she throws an axe at Quinn's head. The warning is enough for Sonny to catch the axe. Why the hell does he keep saving Quinn? He may be worried about the threat of the other Barons invading but life has still got to better with that mustache twirling villain gone. The fight is on and M.K. chases down Tilda but is cut and goes all warrior. Tilda finds that she has more on her hands than she bargained for. M,K. prepares to kill Tilda and she calls out his name causing M.K. to come out of his killing rage as Sonny watches. Tilda throws a butterfly ninja star at Sonny and makes her escape. Back at the parlay site, Sonny calls an end to the fighting and reveals the throwing star, blaming the assassination attempt on the Widow. Jacoby makes it clear that it is Quinn's responsibility to put an end to the Widow and her machinations. When Quinn and his men arrive back at his region, Sonny is the first thing to notice that something is wrong. Sonny sees that no one is working the land. They speak to a local and learn that Widow showed up and killed all of the Clippers and then bribed all of the cogs to leave with her using the Baron's gold. Ryder meets with Zephyr and the Widow. Ryder at first is not interested in an alliance with the Widow but she promises him what he wants most - to become a Baron in his own right. The only thing that the Widow wants in return is M.K. Sonny goes to see the Rat King, who he learned about from Waldo, to see about transport out of the Badlands. The Rat King makes it clear that he doesn't owe Sonny any favours but agrees to offer safe transport if Sonny hands over M.K. It seems that M.K. killed an entire cargo of slaves belonging to the Rat King and that the Rat King wants revenge. 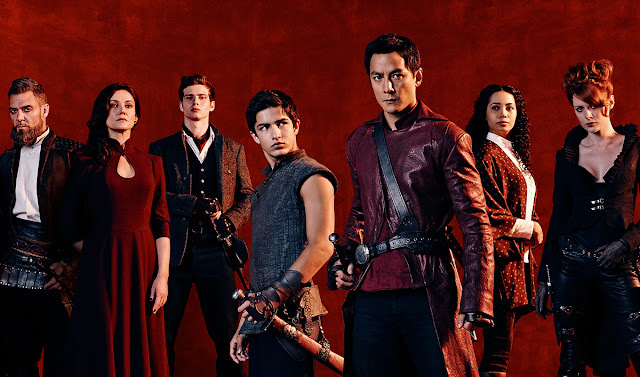 I still think that Into the Badlands is beautiful to watch and that the fight scenes are beautifully choreographed but at four episodes into this first season, I should be able to say more positive things about it. The characters have yet to move beyond tropes and cardboard cut outs. Quinn in particularly irks me because each episode I feel that he should be twisting his evil mustache and cackling manically with glee. Clearly M.K. is the chosen one but so far we have not idea why he is special. In fact, each episode of Into the Badlands has gone to great lengths to remind us of M.K. 's chosen one status and how desired he is as a vehicle to power but there has been no explanation or even the smallest hint as to what is behind it all. Now Sonny has even more incentive to hand M.K. over given that the boy at least partially admitted that he is not sure how to get to Azra and Veil has enacted a plan of her to bring an end to Quinn. Each time Sonny actively saves Quinn has me rolling my eyes. It's clearly a delaying tactic because at the end of the day, he is going to have to face his Baron. Waldo warned Sonny that if left, Quinn would hunt him to the end of time. I suppose there is some argument to just riding it out until Quinn's death but if that is the case, stopping it makes absolutely no sense. We have seen Sonny save Quinn at least twice so far and it just gets more irritating. Next to Quinn, I would say that Ryder is the next largest cut out. I expect him at any moment to break into I Just Can't Wait to be King from The Lion King. True, his parents are both calculating unsupportive murderers but I fail to see anything good about Ryder. I think Sonny should just kill Quinn, hand over the reigns to Ryder and ride off into the sunset with Veil and M.K.. Little Ryder worry about what happens to the region. The female characters are actually a bit more interesting. We have the Widow who wants M.K. for some sort of nefarious purpose. She is hard on herself and her tropes but I sense that there might be more depth behind the veneer. We learned that Lydia not only sees everything but is capable of murder if necessary to maintain her position. Lydia calls it like she sees it and is unafraid to speak. Then there's Veil who is determined to make her own decisions about her reproduction and is clearly not waiting around for Sonny to give her justice. She is going to slowly kill the Baron on her own. It's a bit early to judge Zephr yet but I think that there's something there. There are so many interesting female characters I wish they were the focus on the show because the men seem to be all about bravado or wanting to play hero.